Hi all. Last year my friend and master builder Matteo Rufini built Vera for me. Vera is my gorgeous fretless bass you should be looking at right now in the picture that accompanies this blog entry. When he built Daphne, my custom P – Bass I wrote a detailed build diary which you can find on my blog. This time around I couldn’t commit to doing that because in the meantime I became a father and babies are notorious for diverting your attention from writing blog entries. But I did not want to leave the arrival of Vera uncelebrated, so I wrote this short piece… then I lost it in the maze of my various cloud based storage accounts. Last week, during a bit of a clean up, I found it again, so I decided to share it with you at last. If you’re reading this you’re probably looking at one of Matteo’s sonorous masterpieces; if that is not the case, drop everything you’re doing, go to https://www.facebook.com/Rufiniliuteria and click that like button. Anyway – last year the skilled hands of my guitar building brother gave me Daphne, the best bass I’ve ever laid my hands on. And I’ve had the pleasure of owning quite a few outstanding pieces. Fenders, Music Man, Alembic, Ibanez, Tobias. My Rufini Precision custom belongs in the same league and more! Now that I think about it, it’s exactly a year since I opened that case to reveal my noise making companion and I have used her exclusively ever since. I have been gigging with her at least twice a week, brought her to all my studio sessions and traveled all over the country in her company. She always sang to me and my audiences in her powerful voice. And looked stunning too. Sometimes while onstage I just look down at her and feel so lucky and grateful for such a fine instrument. I think Matteo is slowly realising that when he gets an overexcited whatsapp message from me – usually around 3 AM, that means there might be fun times ahead. Next thing you know, it’s time for me to ask the master builder to give me another masterpiece so I can play more music to more people with a different voice. As I’m writing this, Matteo is hard at work on Vera, a bass whose concept has been in my head for quite a long time. 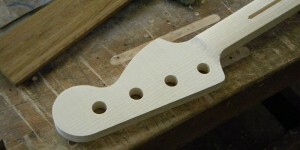 It’s a Fender – shaped five string fretless beauty and she’ll be strung in tenor tuning (with a high C). I believe as you read this you’ll be able to see some pictures of her. I can tell you she is going to be a stunner. The body is carved from a single piece of American black walnut. 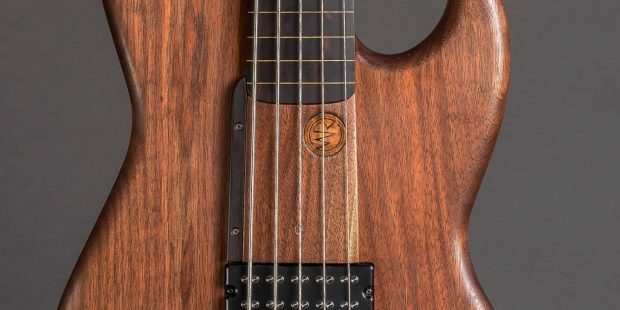 The choice of wood is not casual; we discussed the inherent sonic properties of it and we found that it was the best choice for the kind of fretless sound I have in mind. 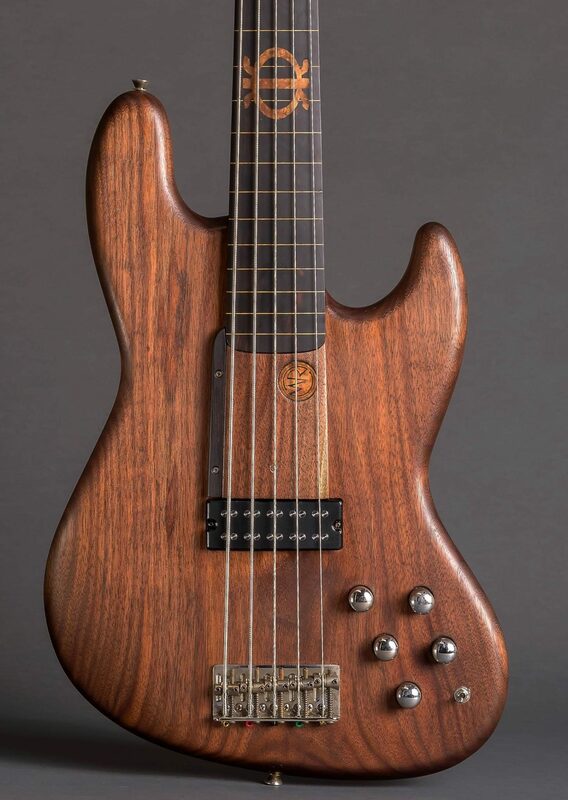 Also, walnut is the ideal fretless wood according to Ian Waller and Pete Stevens, the two dads of Wal basses. Good for them, very good for me! The fretboard will be a beautiful piece of Macassar Ebony with very subtle figuring. Perhaps surprisingly the pickup will be placed at the sweet spot between the neck and the bridge to produce a mellow and blossoming tone. The sound I have in mind is very different the iconic Jaco growl and it is more of a creamy, singing voice more akin to the great tones of Mick Karn, Pino an especially my all – time favourite fretless player: Percy Jones. I asked Matteo to build a ramp to be placed under the strings, kinda like what Gary Willis, Matthew Garrison and Janek Gwizdala have on their basses. That helps me achieve a subtler playing technique more appropriate for such a responsive instrument. One last word about the gorgeous inlay at the 12th fret. The symbol (Adinkra) belongs to the West African tradition and means “The seed of the wawa tree” which represents the virtue of perseverance. I think this is enough now to get you interested in this new Rufini creation. I’ll be writing a more extensive build diary on my website www.jordanbrown.co.uk with lots of pretty pictures too.